Thanks to UAVs there is a growing potential for the provision of high quality visualizations of sites from the air for public consumption; whether as part of the requirement of many archaeology companies as charities, as part of planning policies to interact with the public, or the growing importance of crowdfunding archaeological excavations (DigVentures) which require interaction with their backers. UAVs can provide a means of providing this sort of imagery as part of an overall recording strategy. This includes the recording of site tours which can provide details of a sites which can easily be disseminated to the public. At its simplest the UAV can provide an aerial element to the video of the site tour by flying past or through elements of the site or flying past or hovering in front of the site tour guide. 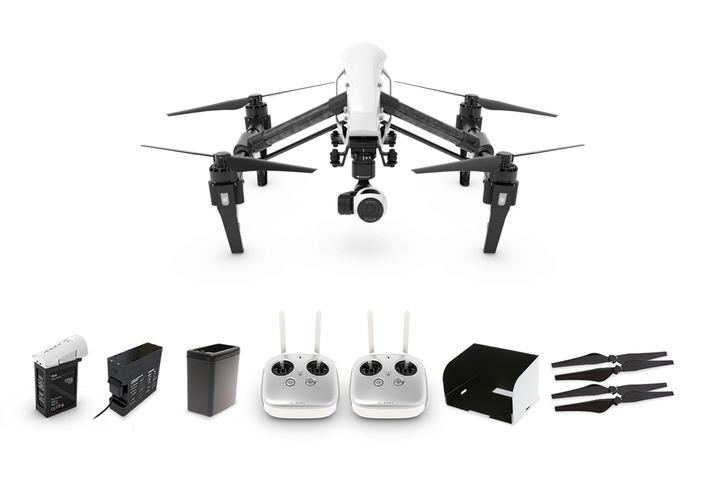 The DJI Inspire 1 is one such aerial video platform which can be purchased with two remote controllers; one for controlling the UAV, while the other is used to control the camera gimbal. This allows a pilot to fly the UAV on a set path while someone experienced in film making has complete control of the camera. The UAV pilot recording the site tour. There are two ways in which this can be done. 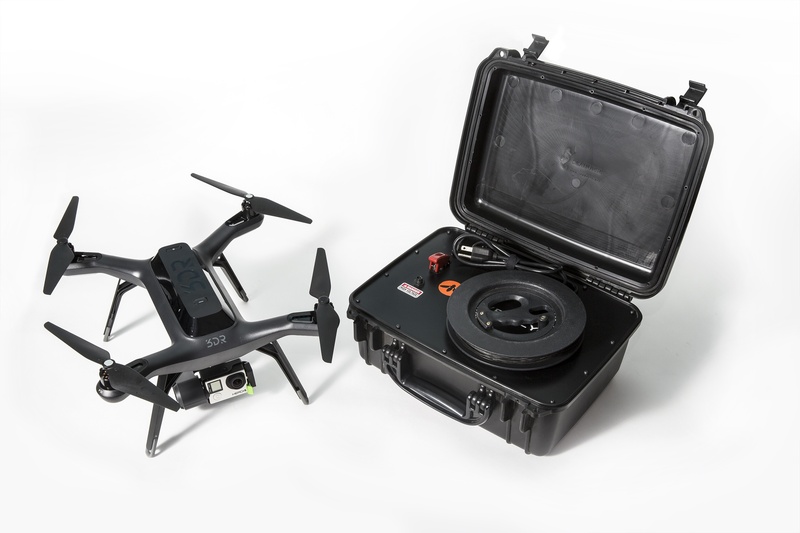 This functionality is available on many UAVs, including some of the DJI series and those using the open source PX4 and Pixhawk autopilot technologies. 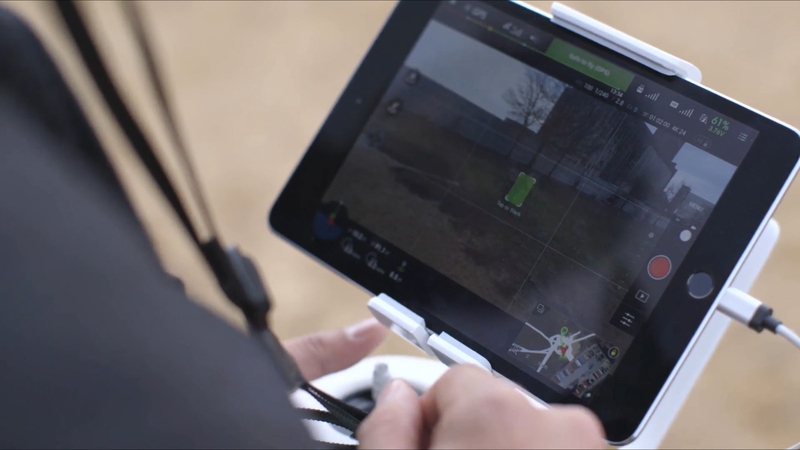 With the PX4/Pixhawk systems the mode can be controlled from a number of base station software solutions including Tower, which can run on Android mobile devices such as smartphones. 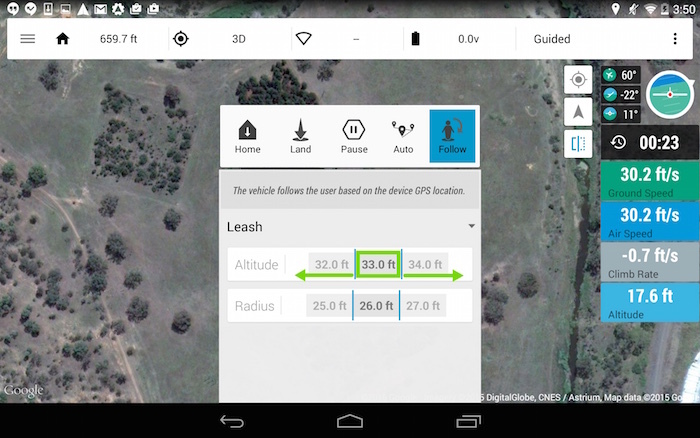 The systems uses the GPS of the mobile device as a target for the UAV. Leash – UAV follows actor. Lead – UAV leads actor pointing back at them. Left/Right – UAV keeps pace with actor to the side. Circle – UAV circles actor at specified radius. The system also controls the camera gimbal, pointing the camera towards the GPS enabled device. Together these controls can provide various aerial video elements useful for integration in a site tour video which can be controlled directly from the mobile device in the hand of the site tour guide. Computer Vision technologies are an important developing area in robotics and are beginning to be fitted to UAVs. 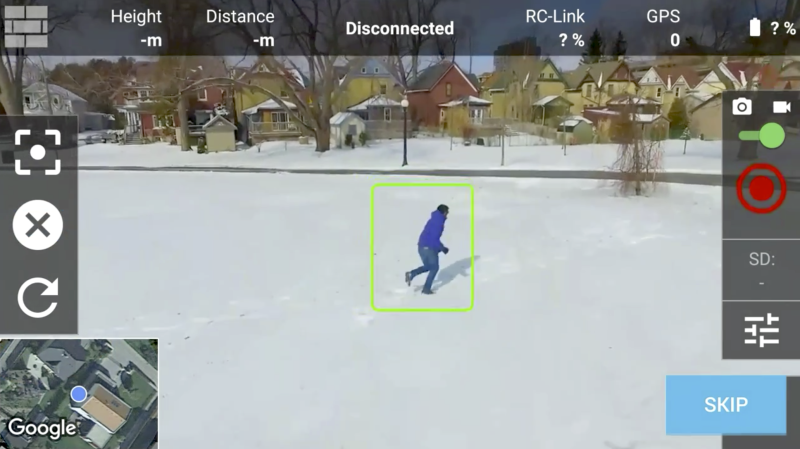 Some of these technologies use image recognition algorithms to match the subject matter between consecutive video frames allowing the UAV to follow a person or object even when it is rotating and so changing the way it appears. Currently in beta testing the Vertical Studio app (available on iOS and Android) uses existing camera hardware on the DJI Phantom 3 or Inspire to provide the imagery for the image recognition algorithms running in the app. 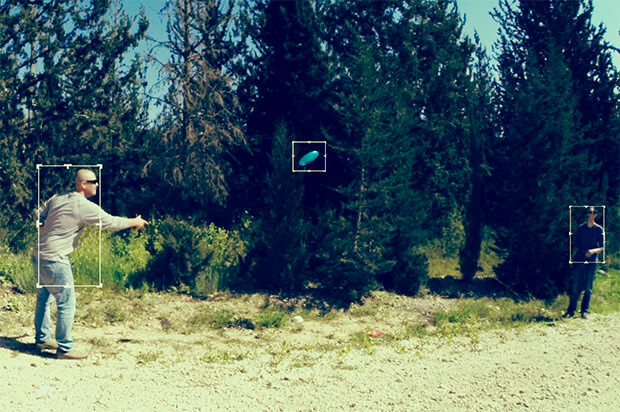 A target is chosen in the app which then controls the flight of the UAV. You can also draw walls in the app that designate no fly areas for the UAV. 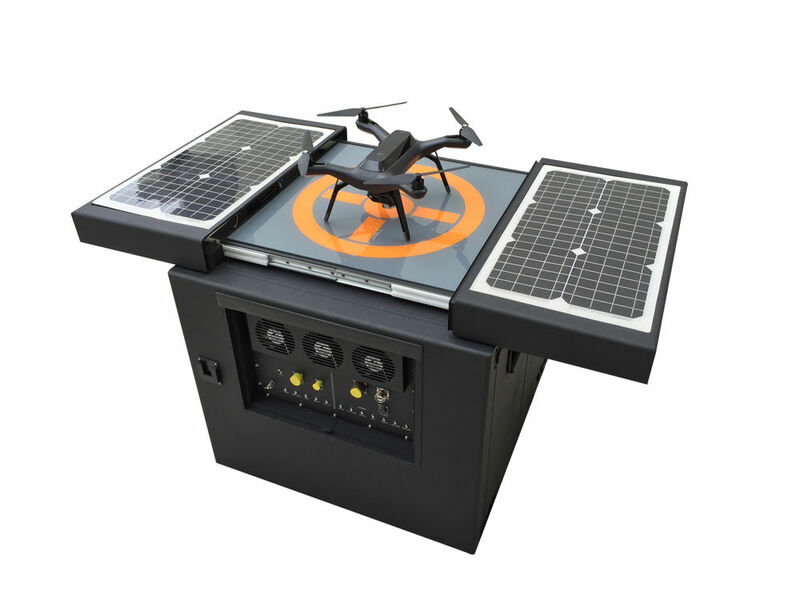 The second is an add-on technology that is fitted to an existing UAV, which connects to the autopilot and controls the flight of the UAV. In the case of the Percepto (funded on the Indiegogo crowdfunding website) the processing is done in a companion computer while the video is taken from an add-on camera, controls are then sent to the autopilot and gimbal to control the movement of them in relation to the subject matter. The third is an an integral part a newly built UAV, but is in effect a very similar technology to B. This is the case with the soon to be released DJI Phantom 4, which is the first commercially available UAV with the technology integrated into it. 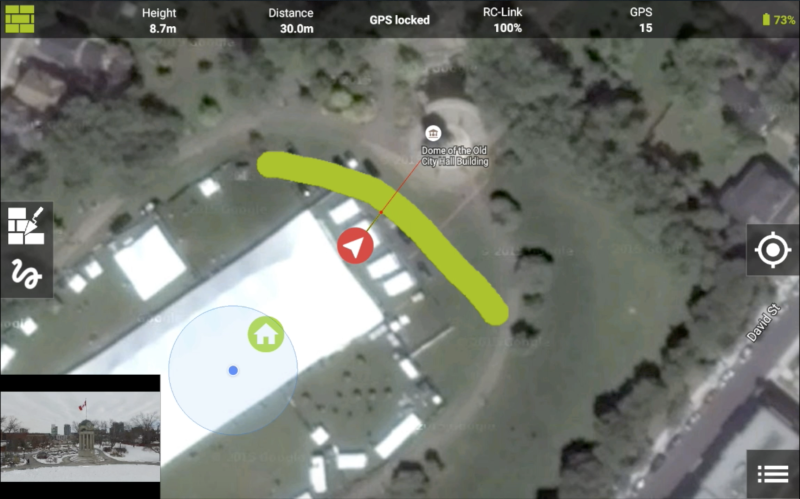 The app connects to a companion computer on the UAV which uses the imagery from the camera as a source for the computer vision algorithms. 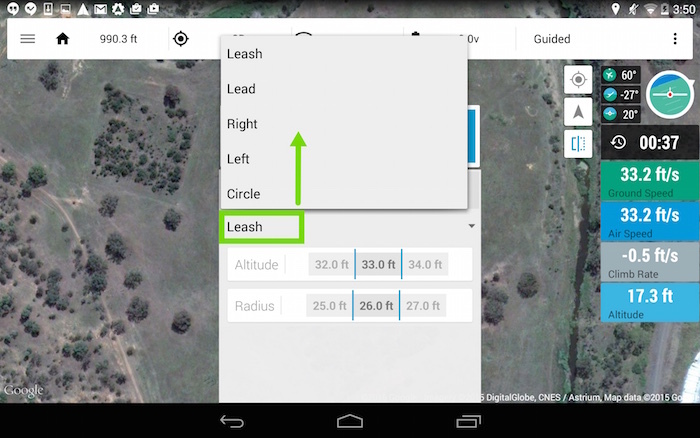 Once again the subject matter is selected in the app and the UAV will follow it. On the 9th of September Chris Anderson, the CEO of the 3DRobotics (3DR) Drone company, gave the keynote speech at the International Drone Conference and Exposition (InterDrone) Conference in Las Vegas on the future of drones. He discussed the previous democratizing of technologies such as the personal computer and the internet which put powerful tools in the hands of normal people empowering them; and that thanks to drone development remote sensing will develop in the same direction. With improvement satellites have the potential to reduce their costs in remote sensing by a factor of 1 in 10, while drones have the potential to reduce the costs by a factor of 4 in 10. The reason that the mobile phone network beat satellite phones is the same reason that drones will beat satellites in recording. Drones have the ability to scale in a way that satellites cannot. He compared the pros and cons between Satellite, manned aircraft and drones in a hypothetical recording of the American State of Kansas. His model suggested that satellites and drones would have the same setup costs; with 100 satellites costing 100 million dollars and 200,000 drones costing the same amount to capture Kansas on a daily basis. The satellites have high maintenance costs as they are located in space, while drones have much lower costs while piloted and less when un-piloted. The drones have the potential to record a site on the hour every hour. Also at any one times 2/3 of the planet is under cloud cover making the drones the much better option as they generally fly under the clouds. He concluded that for mapping 50 hectares the satellites would be the much cheaper option, but for mapping 5 hectares the manned drone is the cheaper option, while the manned aircraft was the worst option in all cases. But autonomous drones operating as a fleet would be the better option all the way up to 500 hectares. With the development of autonomy drones, rather than doing things in the same way as manned aircraft they could do things in whole new innovative ways. Record every hour on the hour. Charge themselves on charging pads. Be based in weatherproof boxes. These technologies are possible now and 3DR support both swarming and fleets. It could be possible to control 200,000 drones from a web browser a thousand miles away. Both 3DR and DJI are migrating all of their control functions to mobile devices meaning that the platforms can act as connected devices from the start. Drones as vehicles – 500 thousand. Drones as cameras – 1 million. Drones as something bigger – 10-100 million potential. The drones have the potential to act as sensors connected to the internet almost forgetting about the device, with its data being passed to the cloud. He also discussed how drones came about thanks to mobile phone technology and its significant investment in the research and design of the technologies which enable phones to work including GPS, accelerometers as well as their computing technology. The mobile phone industry developed these technologies which allowed the drone industry to begin. 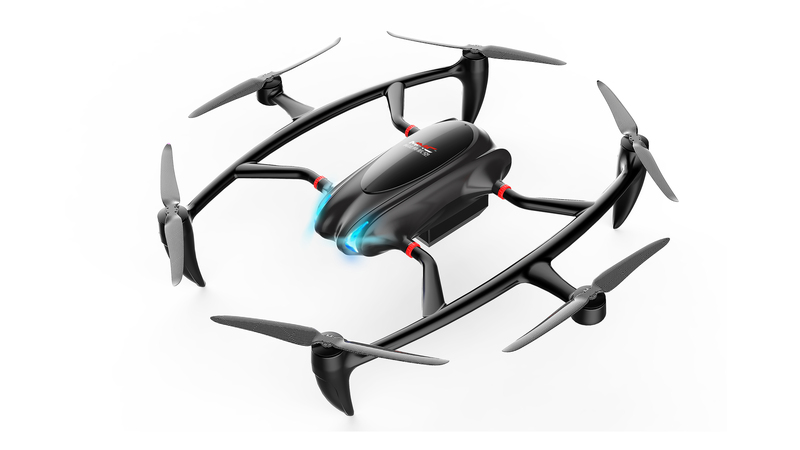 The drone is basically a smartphone with propellers. 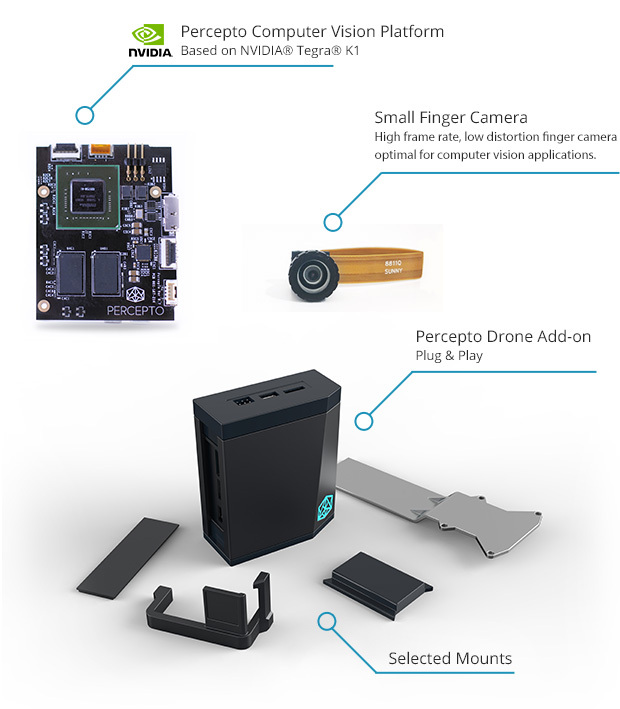 With improvements in the on-board computing processing power drones now have the ability to us the Robotic Operating System (ROS) allowing the drone industry to draw on the extensive academic developments in AI (Artificial Intelligence), Computer Vision, path-finding and other technologies. With ideas from a number of different industries converging. 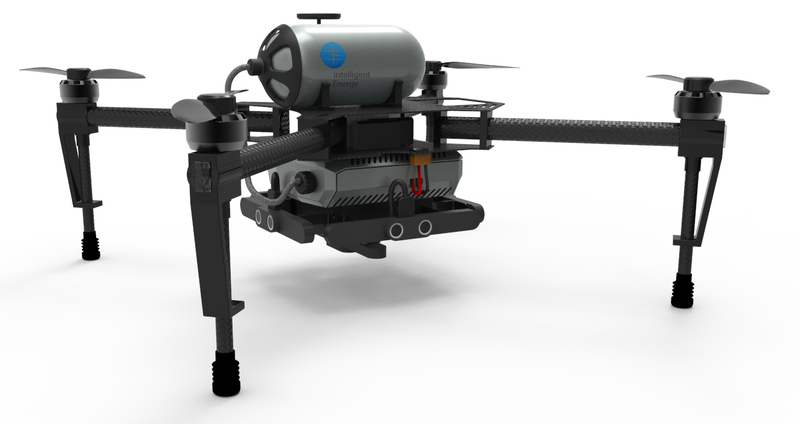 The Dronecode project has already brought together a number of open source drone projects under the governance of The Linux Foundation. Ardupilot, PX4 and Pixhawk autopilot systems. 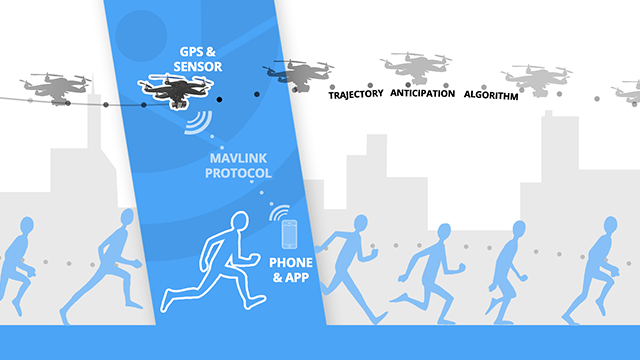 MAVLink (Micro Aerial Vehicle Communication Protocol). UAVCAN is a lightweight protocol designed for reliable communication in aerospace and robotic applications via CAN bus. ROS – The Robot Operating System (ROS) is a set of software libraries and tools that help you build robot applications. Cloud based systems such as droneshare and dronedeploy allow both the control and processing of drone data from within the cloud. On-board HD video streaming support. Optical flow and GPS denied navigation. Obstacle detection and avoidance (LIDAR, IR/thermal). Out-of-the-box Search and Rescue capabilities. The drone has become possibly the most complex consumer product outside of the car industry, and continues to evolve.